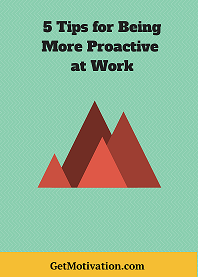 There’s a reason why being proactive is linked to success. People who take an active role in the workplace are the ones who inevitably perform better and get noticed by superiors. A take-charge mindset is empowering, because it gives you a sense of control over your role, allowing you to balance multiple responsibilities without compromising the quality of your work. By learning how to tackle tasks more readily and skillfully, you can be more productive, avoid pitfalls and experience faster professional growth. To learn how to be more proactive, follow these helpful tips. The key to being proactive is organization — after all, you can’t take the reins on your responsibilities if you’re dealing with chaos. This goes beyond just using a weekly planner and keeping your desk clutter-free, though. You’ll need to learn to prioritize tasks if you want to meet deadlines, which means being realistic about how much time you’ll need for certain assignments. Instead of simply marking when a report or proposal is due on your calendar, note several important points leading up to the deadline so that you can effectively manage your time. Consider writing a reminder two weeks, one week and then several days before an important date so that you can stay on top of what needs to be done. Keep track of how long an assignment takes so that you know how much time to delegate to a similar task in the future. Negativity will get you nowhere — and it will hold you back from reaching your full potential. Instead of focusing on what you don’t get done, concentrate on what you did accomplish. Then draw up a list of goals for the following day. That way, you are continually leaving room for improvement without getting overwhelmed by the demands of your job. Additionally, don’t resort to negativity when something does go wrong. There is always an opportunity to learn from your mistakes, so if an issue arises, take the time to reflect on how you might have handled the situation differently. This allows you to avoid making the same error twice. It may not be easy to speak up, but getting involved in the conversation is what separates leaders from followers. By openly engaging with your colleagues and supervisors, you can influence the course of action and contribute to the solution instead of merely reacting to it. There’s no doubt that you have recognized areas of opportunity in your workplace, and you probably have ideas about how to address them. Start recording these notions as they come to you so that when the chance arises at a company meeting or check-in with your manager, you’re prepared to propose new ideas. There’s no reason to wait for problems to arise to resolve them — instead, use self-reflection techniques to avoid potential problems altogether. Develop a detailed plan for projects ahead of time, including a checklist of the information or resources you’ll need to efficiently accomplish each task. Over time, you’ll be able to identify steps that are unnecessary or that may be shortened or consolidated. Always have a fallback plan in case unexpected challenges come up. By planning ahead, you’ll be more prepared for upcoming challenges. Are there natural cycles in your workflow that seem to lead to certain issues? Is there a way to circumvent a roadblock by prioritizing a particular task differently? Asking yourself these questions will prevent you from feeling powerless when disaster strikes. It goes without saying that procrastination is not an option if you’re working to realize your full potential. Don’t get bogged down and stuck in too many details. It’s important to take timely action. Waiting too long to solve a problem or address a conflict — or worse, failing to face it altogether — often means falling behind. Instead, learn to be decisive, even if you’re not 100 percent positive whether you’re taking the right or wrong route. If you’re wrong, you’ll be able to adjust accordingly in the future — but for now, learn to trust your instincts and have confidence in your abilities. Rebecca Lindegren is the community relations manager for MBA@UNC, the online mba degree program for executives offered by UNC Kenan-Flagler. In addition to higher education, Rebecca is passionate about content marketing, brand marketing, skiing and cycling. You can follow her on twitter! If you’re ready to be motivated and inspired to achieve your greatness get your copy of the audio program, Why Perfect Timing is a Myth.